Like many other former towns, the mills have left Gregoire. Gregoire Mills consists of seven or eight houses spread out along Highway 11 between Fauquier and Strickland and that’s about all I could find. Strickland was a stop on the railroad. It’s actually not on any of the maps that I have, it’s listed as a rail stop but there is a sign on the highway for it so I included it in the Highway 11 website. 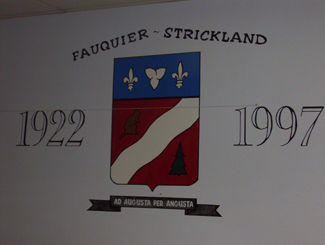 Technically part of Fauquier, there’s not a lot in Strickland. There’s a church, about 15 houses facing Highway 11, and Chez Belanger, the local convenience store. Hello Abdul, I believe I met you in the Strickland graveyard about 2008 while I was visiting. You mentioned starting sheep farming. Hello Abdul. What would bring you to buy a farm in Strickland, Ontario? I was born and raised in that village and farming never seemed to be a way to make a living in that area. Even the federal government could not afford to keep a farm going in that region. My family owned a lot of land in that area back in the 1940 and 1950s. Our farm was just west of the church. looking at the Highway 11 Blog, I read one of your post mentioning your family had some land in Strickland. I am looking for a certain Patrick (Pat) Cloutier, son of Joseph Cloutier and Anna Brassard. He married to Noëlla Deguise (maiden name) in Montréal in 1937. They must have lived in your area in the 1940: I have a couple of pictures of them dated Strickland 1941. Pat used to work, (before or after 1941? ), for a small fair/circus going from town to town. Noëlla was my aunt and I am trying to write my family history. Unfortunately all her brothers and sisters are dead and I am having trouble tracking her. Noëlla died in Kapuskasing around 1998 and I donut know when and where Pat has been buried. Maybe you have known them and could tell me if they stayed in Strickland very long. Any information from you or others would be appreciated. I am George Menard. I live in Niagara Falls. I kne w. Pat and Noella. Please call me at 905 374 1146. Noelle est décédé en 1982 a Strickland et Patrick est décédé en 1978. J’ai des photo des pierre tombales si en veut laisse moi ton email et je te les envoit. I am from England and i have just invested here by purchacing a 150 acre Farm. Nice to be part of this wonderful small community. Hello Abdul, I saw your blog while looking for land in Strickland. I am very interested to know if you are selling your land at this time. Have a friend in Strickland and would like to purchase land close to them.. Thank you so much. Hello Abdul, I saw your blog while looking for land in Strickland. I am very interested to know if you are selling your land at this time. Have a friend in Strickland and would like to purchase land close to them.. Thank you so much. Hope to hear back from you soon. In 1922, Our great grandfather Heikki Myllymaa, built a log house / cabin, on a family homestead of 150 acres, which now has the road named after him. Situated at the end of Thomas road, and in between Goudreau Lake and now ‘Myllymaa Lake’. After his wife died at an early age, he raised three children, Seelim (Henry), Selma (my grandmother) and Sylvi. All went to school at the highway, near Wellington Creek. about a 4 km walk each way, either in the mud, or on skiis. All three children, grew up speaking French, Finn, or English. Rare. The camp still stands and our family still uses it often. There were several homesteads along that road, remains can still be found. I know of 3 only, the post here from Michel Trottier, speaks of Lac Goudreau, all i know is there was a family there with 17 children(correct?) and the name of the lake is Lac Artur, after Mr. Goudreau. I’m now 47, and have been part of the ‘Gregoires Mill’ landscape since I was 2, would be interested to hear from anyone with more history on the area. This summer will mark the 90th anniversary of our camp ! I am George Menard. I was born on the east side of Gaudreau lake and know all the people that you mention. Please call meat 905 3774 1146. George. Ma mËre est nÈe au lac Goudreau (batardisÈ de Gaudreault). Sa famille Ètait le premiËre et la seule autour du lac autour de 1930-1950. Il n’y avait pas de route pour se rendre au lac ‡ cette Èpoque. Il y avait aussi a Grégoire Mills deux moulins en bois et deux Ècoles de rang pour accueillir les Èleves de nombreuses familles d’autrefois. 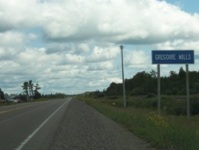 Sur la route, nous voyons : “Bienvenur ‡ GrÈgoire Mills” … et 4 maisons plus tard… “Aurevoir Gregoire Mills” !